Star Wars has been far more than just world class entertainment, though. The way the movies were made has had a major impact on Hollywood and global film industries. Star Wars is famous for its captivating visuals and its weird and wonderful characters; adventures abound but alongside these, woven into the intricate storylines are admirable values, dreams (and even fears) that we can all identify with on some level. Needless to say, Star Wars is kind of a big deal. Such a big deal, in fact, that it has a whole day dedicated to it once a year. 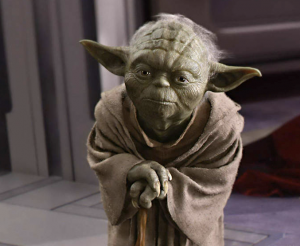 International Star Wars day takes place on May the 4th each year, and on this day global citizens in cities, towns and villages get together to celebrate the phenomenon that is Star Wars. Melbourne is no different! 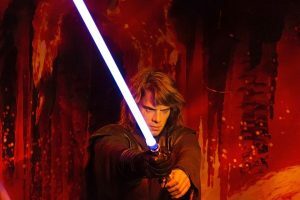 Here you can find numerous events and activities aimed at having fun and embracing Star Wars in all its glory. It may be an obvious activity but nevertheless it’s a worthy one! Whether you’ve seen the movies before or not, they don’t get old. Why not get your friends together and host a movie marathon on a big screen at home, watching as many films as you can cram in from 1977 to date? There are 10 to choose from, so that’s no mean feat! ALIAVic (Australian Library and Information Association) implore you not to fly solo on 4th May. Their Star Wars Day event consists of a 7.30pm screening of Rogue One at Astor Theatre (Cnr Chapel St & Dandenong Rd, St Kilda), and there will be drinks at Holy Grail starting from 6pm. And the best bit? They fully encourage you to turn up in costume! Don’t forget to get a ticket in advance. 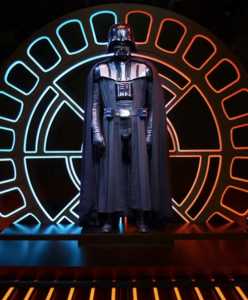 If you want to celebrate Star Wars 40th birthday in a big way, you have the option on 2nd June with Star Walking Inc. The Star Wars Appreciation Society of Australia present ‘FORCE V’, the fifth national Star Wars saga convention of Australia. Aimed at die-hard Star Wars fans, this event promises 3 days of celebration. The event will be held at Jasper Hotel on Elizabeth Street. It’s family friendly and features everything from art exhibitions to films and collectables; there’ll also be special guests and discussion panels – these guys don’t mess about! On the Friday night there’s a VIP cocktail party, and foodies will surely delight in the ‘Big Birthday Banquet’. As the force awakens within you, grab your light saber and wield it with vigour! Who hasn’t wanted to do that at least once? May 4th is your perfect opportunity. Whether you’re going to attend an event or throw your own Star Wars party, there’s absolutely no reason not to do it authentically! What a wonderful range of characters you’ve got to choose from… there are at least 50 worth remembering – that’s more than enough to fill up a costume party or to make for an eye-catching group out in the city, but do you even have enough friends to embody the whole cast?! Who will you be? Chewbacca? Darth Vader? A storm trooper? Maybe you’ll be Obi-Wan Kenobi, or C3P0? Perhaps if you’re a talented contortionist, you’ll squeeze into R2-D2, Yoda or Ewok attire? Be the star of the show as Luke Skywalker or Princess Leia, or creep out your friends as Emperor Palpatine… you’re literally spoilt for choice. Dressing up doesn’t get much better than this – who hasn’t dreamed of being a Star Wars character at least once in their life? At your party, be sure to show at least one movie, play a Star Wars trivia game, and party to some of the movie soundtracks… and of course no Star Wars party would be complete without costume contest! If you’re not in Melbourne, it shouldn’t be too hard to find a Star Wars related event to enjoy. Cities like London UK definitely aren’t going to be missing out on the celebrations. The Star Wars Identity Exhibition at London’s famous O2 Arena is one not to be missed if you have the chance. 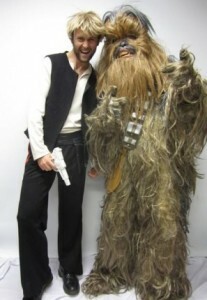 Brisbane Tattersall’s club hosts a Star Wars Charity Gala Ball on 3rd June. This event is exclusively Star Wars themed but dress is ‘formal’, so you’ll need to dress respectably but are welcome to stick a Star Wars twist on things – just no light sabers or blasters! The great thing about this event is that your ticket price goes to Act For Kids charity. You’ll be wined and dined with delicious gourmet foods, a couple of complementary drinks, lots of live entertainment and you’ll be able to get pics with your favourite Star Wars characters. Wherever you are and however you choose to celebrate, we wish you all the fun you can muster. Oh, and before we forget…. May the force be with you!